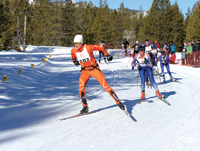 The fifth annual Sun Valley Nordic Festival offers events starting today, Friday, Jan. 24, through Sunday, Feb. 2. Here is a listing of scheduled events—for the latest information, go to www.nordictownusa.com. - Opening-night welcoming celebration at Ketchum Town Plaza, 5-7 p.m.
- Blaine County Recreation District ski free day, 10 a.m. to 2 p.m. at Prairie Creek/Billy’s Bridge, north of Ketchum. This event is replacing the annual Ski the Rails celebration. - Sun Valley Intermountain Junior National Invitational at Galena Lodge. (There will be limited parking, so people should use a shuttle from Baker Creek.) From 10 a.m. to 2 p.m.
- Galena and Trails Winter Benefit: The 18th annual Galena and the Trails Winter Benefit will start at 5:30 p.m. in the Limelight Room at the Sun Valley Inn. Proceeds benefit the Galena Lodge and trails system. - Skiers Special Breakfast/Brunch, from 8 a.m. to noon at Smiley Creek Lodge north of Ketchum. - Ski Tour: Winter Wildlife of the Sawtooths (people must preregister). From noon to 2 p.m. at the Alturas Lake ski area, north of Ketchum. - Snowshoe Tour: History of the Sawtooth Wilderness (people must preregister). From noon to 2 p.m. at Park Creek Lake ski area in Stanley. - Avalanche Awareness & Safety in the Backcountry, from 3:30-5 p.m. at Stanley Town Square. - Skiers Special Dinner, from 5-7 p.m. at Stanley Sluice in Stanley Town Square. - Twilight Ski & Dinner, from 5:30-8:30 p.m. at Galena Lodge, north of Ketchum. - Coaching Through the Ages presentation, at 6 p.m. at The Community Library in Ketchum. - Local Stoker: SVSEF Gold Team, from 9:30-10:30 a.m. at the trail system north of Ketchum. - Paralympic biathlon practice, at 10 a.m. at the Sun Valley Nordic Center. - Lizzy’s Fresh Coffee Tasting, from noon to 4 p.m. at Lizzy’s Fresh Coffee in Ketchum. - Sun Valley Alpine & Nordic Hall of Fame induction ceremony, from 5-6 p.m. at the nexStage Theatre in Ketchum. - Local Stoker: Vamps Coaches, at 9 a.m. on the Harriman Trail (meet at Ketchum Town Square). - Paralympic Biathlon Race, at 10 a.m. at the Sun Valley Nordic Center. - Downtown Jam/NordicTown USA Sprints—Nordic and “fatbike” races at 4 p.m. at the Sun Valley Center for the Arts field in Ketchum. - XC Party, from 5-8 p.m. at Perry’s restaurant in Ketchum. - Boulder Mountain Tour Expo, from 10 a.m. to 8 p.m. at the Wood River Community YMCA in Ketchum. - Friends of the Sawtooth Avalanche Center Incredible Raffle & Banff Film Festival, from 6-10 p.m. at the nexStage Theatre in Ketchum. - 39th annual Swix Boulder Mountain Tour, at 10 a.m. on the Harriman Trail—from Galena to the Sawtooth National Recreation Area. - Swix Half Boulder Mountain Tour, 11:45 a.m. on the Harriman Trail—from Baker Creek to the SNRA. - Swix Boulder Mountain Tour awards ceremony, from 5:30-7 p.m. in the Limelight Room of the Sun Valley Inn. - Reggae in the Mountains, from 5-9:30 p.m. at Ketchum Town Plaza. - Boulder Mountain Tour demo, from 10 a.m. to 2 p.m. at the Sun Valley Nordic Center.